A new paper examining the use of Twitter data has been published in Public Opinion Quarterly. View article on publisher’s website (subscription needed). 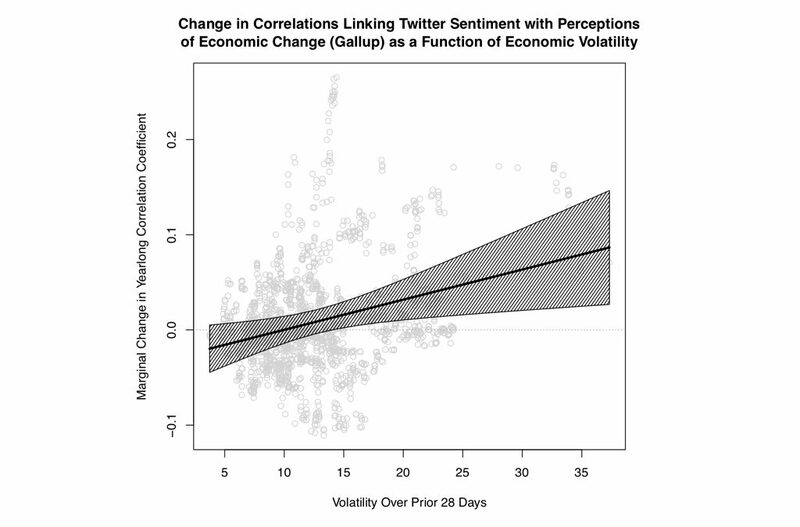 Can Twitter data complement or supplement measures of economic confidence? This possibility was proposed in early work suggesting that sentiment surrounding the word “jobs” on Twitter closely tracked survey measures of consumer confidence. The current study uses knowledge of the processes generating Twitter data to develop and test hypotheses for when social media and survey data might align, and thus when social media processes may reflect survey measures. We expect and find the greatest correspondence when Twitter data were used to predict perceptions of recent societal economic change, rather than the aggregations of pocketbook economic experiences or reports of the state of the economy. In contrast to the concerns many scholars have raised about nonprobability data sources, the results suggest that correspondence between Twitter data and survey data did not depend on how similar Twitter users were to the population. Finally, we find evidence that the correspondences that did emerge were highly variable over time and appeared to be induced in the presence of economic volatility, suggesting that consistent long-scale trends may not be driven by consistent small-scale mechanisms. Pasek, Josh, et al. “The Stability of Economic Correlations over Time.” Public Opinion Quarterly, vol. 82, no. 3, 2018, pp. 470–492., doi:10.1093/poq/nfy030.